The Festival is the result of an initiative from the Scripture Working Group of the Bishops’ Conference and has been developed by a group of Catholic Dioceses in the north of England, with the aim of ‘Celebrating God’s Word in fun, inspiring and informative ways’. Tickets are only £5 and booking is available online at http://www.scripturefestival.org/. 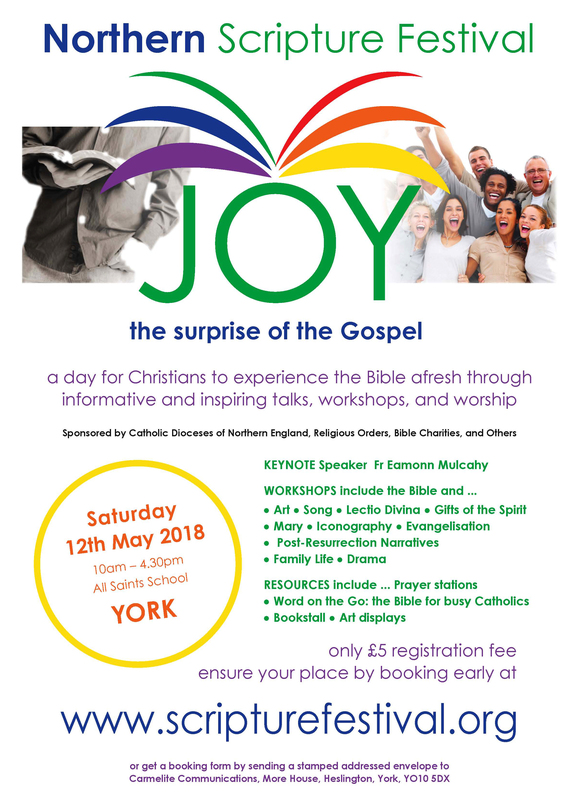 It’s going to be a joyful and informative day, rooted in the Catholic Christian tradition but open to all who want to know more about the Bible, and to encounter God’s Word in new and dynamic ways. Through talks, workshops, exhibitions and worship, Festival-goers will see the Holy Scriptures in a whole new light! If you have any queries, please don’t hesitate to get in touch at adulteducation@hallam-diocese.com.